“I have spent several days lecturing at the WORLD ENVIRONMENTAL CONFERENCE on “Aspartame marketed as ‘NutraSweet’, ‘Equal’, and ‘Spoonful”‘. In the keynote address by the EPA, they announced that there was an epidemic of multiple sclerosis and systemic lupus, and they did not understand what toxin was causing this to be rampant across the United States. I explained that I was there to lecture on exactly that subject. In the cases of systemic lupus, which is triggered by Aspartame, the victim usually does not know that the aspartame is the culprit. The victim continues its use aggravating the lupus to such a degree, that sometimes it becomes life threatening. During a lecture I said “If you are using Aspartame (NutraSweet, Equal, Spoonful, etc.) and you suffer from fibromyalgia symptoms, spasms, shooting pains, numbness in your legs, cramps, vertigo, dizziness, headaches, tinnitus, joint pain, depression, anxiety attacks, slurred speech, blurred vision, or memory loss — you probably have Aspartame Disease!” People were jumping up during the lecture saying, “I’ve got this, is it reversible?” It is rampant. Some of the speakers at my lecture even were suffering from these symptoms. In one lecture attended by the Ambassador of Uganda, he told us that their sugar industry is adding aspartame! He continued by saying that one of the industry leader’s son could no longer walk – due in part by product usage! Here is the problem. 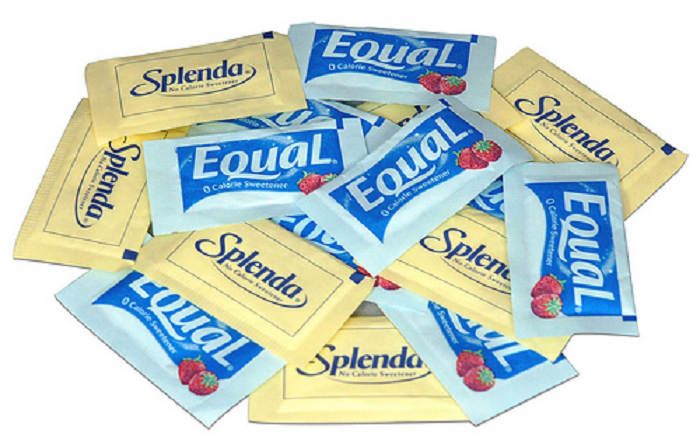 There were Congressional Hearings when aspartame was included in 100 different products. Since this initial hearing, there have been two subsequent hearings, but to no avail. Nothing as been done! The drug and chemical lobbies have very deep pockets. Now there are over 5,000 products containing this chemical, and the PATENT HAS EXPIRED!!!!! At the time of this first hearing, people were going blind. The methanol in the aspartame converts to formaldehyde in the retina of the eye. Formaldehyde is grouped in the same class of dmgs as cyanide and arsenic– DEADLY POISONS!!! Unfortunately, it just takes longer to quietly kill, but it is killing people and causing all kinds of neurological problems. Aspartame changes the brain’s chemistry. It is the reason for severe seizures. This drug changes the dopamine level in the brain. Imagine what this drug does to patients suffering from Parkinson’s Disease. This drug also causes Birth Defects. Memory loss is due to the fact that aspartic acid and phenylalanine are neurotoxic without the other amino acids found in protein. Thus it goes past the blood brain barrier and deteriorates the neurons of the brain. Dr. Russell Blaylock, neurosurgeon, said, “The ingredients stimulates the neurons of the brain to death, causing brain damage of varying degrees. Dr. Blaylock has written a book entitled EXCITOTOXINS: THE TASTE THAT KILLS (Health Press ). Dr. H.J. Roberts, diabetic specialist and world expert on aspartame poisoning, has also written a book entitled DEFENSE AGAINST ALZHEIMER’S DISEASE. Dr. Roberts tells how aspartame poisoning is escalating Alzheimer’s Disease, and indeed it is. As the hospice nurse told me, women are being admitted at 30 years of age with Alzheimer’s Disease. Dr. Blaylock and Dr. Roberts will be writing a position paper with some case histories and will post it on the Internet. According to the Conference of the American College of Physicians, ‘We are talking about a plague of neurological diseases caused by this deadly poison”. Dr. Roberts realized what was happening when aspartame was first marketed. He said “his diabetic patients presented memory loss, confusion, and severe vision loss”. Fortunately, we had speakers and ambassadors at the Conference from different nations who have pledged their help. We ask that you help too. Print this article out and warn everyone you know. Take anything that contains aspartame back to the store. Take the “NO ASPARTAME TEST” and send us your case history. Dr. Roberts says “consuming aspartame at the time of conception can cause birth defects”. The phenylalanine concentrates in the placenta, causing mental retardation, according to Dr. Louis Elsas, Pediatrician Professor – Genetics, at Emory University in his testimony before Congress. In the original lab tests, animals developed brain tumors (phenylalanine breaks down into DXP, a brain tumor agent). When Dr. Espisto was lecturing on aspartame , one physician in the audience, a neurosurgeon, said, “when they remove brain tumors, they have found high levels of aspartame in them”. Stevia, a sweet food, NOT AN ADDITIVE, which helps in the metabolism of sugar, which would be ideal for diabetics, has now been approved as a dietary supplement by the F.D.A. For years, the F.D.A. has outlawed this sweet food because of their loyalty to MONSANTO. If it says “SUGAR FREE” on the label– DO NOT EVEN THINK ABOUT IT!!!!!l! Senator Howard Hetzenbaum wrote a bill that would have weaned all infants, pregnant mothers and children of the dangers of aspartame. The bill would have also instituted independent studies on the problems existing in the population (seizures, changes in brain chemistry, changes in neurological and behavioral symptoms). It was killed by the powerful drug and chemical lobbies, letting loose the hounds of disease and death on an unsuspecting public. The poison ASPARTAME is found in all DIET soft drinks, most brands of chewing gum and everything with nutrasweet. Whoever cleverly controls what is in our foods must be trying to control society- either that or make the doctors richer- if an average citizen as myself can find out these things this easily I am sure the government knows quite well these poisons are killing people. Barbara Mullarkey, Editor, Bittersweet Aspartame – A Diet Delusion, Available from the Aspartame Consumer Safety Network.